If you've listened to the latest podcast episode or read the latest Creative Digest newsletter, you know that I'm planning to take a few weeks off from both of those projects. Breaks are important, you guys. In a world that is overly connected, those of us who create content often feel as though we have to churn out new, wonderful, amazing things for you to read, watch or listen to all the time. The internet never sleeps and it's really easy to feel as though you may become irrelevant if your blog or podcast (or YouTube channel, or Instagram feed, or, or, or...) goes dark for a bit. Thing is: the more I take breaks, the more I realize that's simply not the case! I've also come to realize that I'm 100% better at my job (and better at life, if I'm being honest) when I allow myself the opportunity to step back and take a breather. So as planned, the first break of CYOP Season 3 is upon us! You can expect new episodes to start rolling in sometime in late May. If you're a new subscriber to the Creative Digest (welcome! ), you'll see the weekly newsletters pick back up around the same time. On a much-needed vacation with my husband. Working on some really fun freelance projects. Prepping for a few upcoming events. I know you all can probably relate in some way to this need to press pause and I really appreciate that about you. I'm curious: have you ever taken a hiatus from projects or the internet, in general? How'd it go? Let's talk about it! Announcement: 100 Days of Discussion Book Coming Soon! As I mentioned last week, I'm having a bit of trouble getting over the post-vacation blues. Visiting Montana is always incredible (this was our 5th trip! ), but Glacier National Park now has a very special place in our hearts. It only took one hike for us to declare the park as our new favorite. Our favorite used to be Grand Teton National Park and while those stunning peaks are still high on the list, Glacier offered us an incredible glimpse at why the park is known as The Crown of the Continent. When planning our trip, we knew that visiting in spring or early summer (before the 4th of July) might preclude us from some activities. Sometimes the Going-to-the-Sun Road doesn't open until mid-July (it's the only route through the park) and many of the high elevation hikes remain closed until mid-summer due to snow hazards. However, we decided to visit during the first full week of summer and we're so glad we did. Quite a bit of snow (and wind -- cue the crazy hair) at Logan Pass! The Highline Trail was still closed for the season at the end of June. Not pictured is the "closed" sign. Keep in mind that trails like this one are closed for a reason. A man died the week we were there as he tried to navigate the snowy areas of this very trail. He slipped and fell about 100 feet on to the Going-to-the-Sun Road. So sad. While we didn't get to hike the Highline Trail (it's a bucket list item for sure, but we had no intention of risking our lives), it rained the first three days of our trip and East Glacier's winds literally blew us away (seriously, I almost lost my hat twice and constantly fumbled with my camera trying to hold it steady), we arrived just two days after the Going-to-the-Sun Road opened for the season and were greeted with smaller crowds, abundant wildlife, and beautiful wildflowers. Cinnamon black bear grabbing a snack near the Many Glacier entrance to the park. Wildflowers along the hike to Avalanche Lake. A curious deer near the small town of Polebridge, Montana. 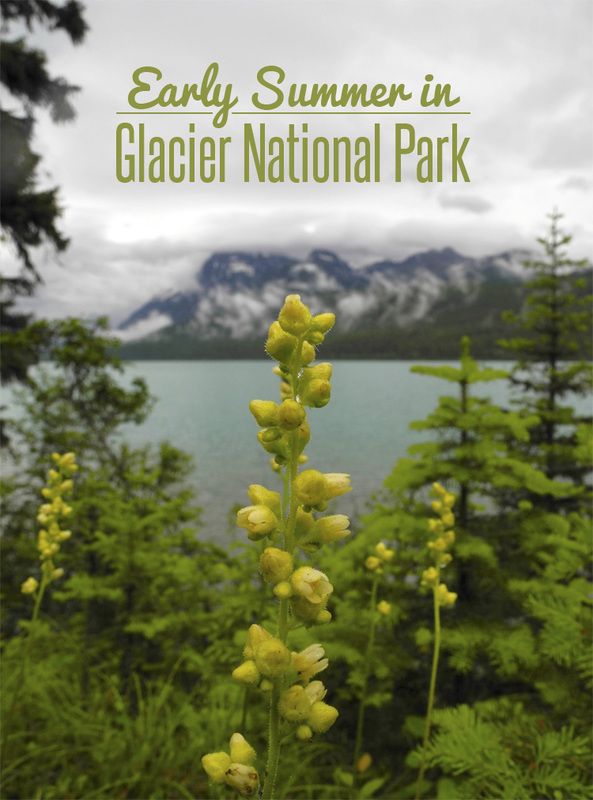 The hike to Red Rock Falls (in the Many Glacier area) is full of wildflowers in early summer! We found this pretty little thing while hiking around Bowman Lake (in the Polebridge area). More beauty on the drive to Bowman Lake (warning: it's a very bumpy road, but it's so worth the drive). Can you spot the bighorn sheep on the mountain? My handsome guy pausing to catch a glimpse of Avalanche Lake. Talk about a rock and a hard place, huh? Plants in Glacier National Park seem to take what they can get! This fern was trying to find the sun along the hike to Red Rock Falls. A couple of grizzly bears feasting near Lake Sherburne in the Many Glacier area. ...they weren't too interested in the line of cars parked on the side of the road. ...filling their big bellies was the name of the game that afternoon. More beauties appearing out of the rock walls of Sunrift Gorge along the Going-to-the-Sun Road. We had several other wildlife sightings, but were too engrossed to bother with the camera. We even spotted a deer and her newborn fawn as they crossed the Going-to-the-Sun Road one morning. The poor fawn fell to the ground right in the eastbound lane and we weren't sure if it would get up. Traffic came to a halt and we all quickly joined team baby-deer-please-cross-the-road-safely, cheering and tearing up (okay, that was me) when the little one finally got to its four wobbly feet and caught up with mom on the other side of the road. Phew. I'm telling you, my friends, Glacier National Park has got it all. If you're planning a trip to the park and you're looking for perfect weather, dry roads and open high elevation trails, don't go in early summer! Weather can be unpredictable and can cause road closures and delay trail openings. You will likely get wet (read: soaked) while hiking. On the other hand, if you're interested in exploring creek and lakeside trails without crowds of people and want to experience spring-like wildlife behavior, early summer might just be the best time for you to visit. I've got much more Glacier National Park goodness to share in the coming weeks, so stay tuned! In the mean time, I want to know: Have you visited Glacier National Park? What was your favorite hike or scenic drive? Any crazy wildlife stories? I'd love to hear more about your experiences, so share away in the comment section! That's a thing, right? The post-vacation blues? It must be, because I'm fairly certain I've got a pretty serious case on my hands. By this time last week, we had already indulged in some incredible outdoor adventures in Glacier National Park and I'm having a wee bit of trouble adjusting to "real life" back here at home. Have any of you experienced something similar? We came back to temperatures well over 100 degrees, terrible air quality, an adorable dog who somehow managed to get himself a pretty impressive puncture wound (all signs are pointing toward a speedy recovery), work stress and more. I want to know: How do you deal, oh wise ones? What helps to get you back into the swing of things when all you want to do is hop right back in the car and run away from home? I could really use your advice because this recent trip to Montana has me... let's just say... questioning my priorities. Sooo... I tend to over-plan things. Just ask anyone I've ever vacationed with. They'll tell you. I read guide books, search the vastness of the internet and get recommendations from friends. If we're heading to an unfamiliar city, I'll get my bearings beforehand via google maps and spend embarrassing amounts of time researching neighborhoods to find the optimal location for our home away from home. For trips to parks and hiking spots, I'll try to scope out both popular and less-frequented trails. I do my best to figure out when to get to the trailhead parking lot and what our alternate options might be should the lot be full of fellow tourists. I'm not particularly proud of this little facet of my personality and I try really hard to tame the urge to fill every moment. Over-planning has actually ruined vacations. Our honeymoon in Maui? Didn't love it. I over-planned the you-know-what right out of it. Why the heck didn't I just "plan" on snorkeling and reading a book on the beach every day? It was a vacation, after all. In short? Because I'm me. That said, the planner in me has also been a hero on occasion. That grocery store in Boston that just happened to be in the same building as the rental car drop-off and an easy two block walk to our condo? Not an accident. I planned that. The spectacular views of the Teton Range from the Moulton Ranch Cabins. Yep... booked that cabin for a reason. I enjoying planning, researching and plotting sites on the map. I really do. However, with each new trip, I learn to take one more baby step back from the computer, apps, magazines and guide books. I'm learning that planning is one thing and over-planning is another and, quite frankly, it is not a good look on me. I'm trying to let trips "just happen," to a certain extent. And you know what? It's kind of great. We have no clue where we're staying the first night of our road trip to Glacier National Park. We have hikes on our list, but weather and other factors may cause us to pick another trail or a completely different activity. We have our passports ready just in case we make it to Waterton Lakes National Park in Canada, but we aren't really sure if that's going to happen. Other than the days spent in the car, we have none of the other days mapped out. Yes, I will always have some sort of plan, but I'm working hard to be more flexible when it comes to the reality of travel. Because sometimes you have a walking tour planned, but you really just want to drink wine and read local alt. weeklies on your rented condo's awesome rooftop terrace. Am I right? I hereby promise to let the relaxing rooftop terrace option win from time-to-time. You can all call me out if I slip up. Deal?